Twenty-four managers were appointed to English League Two clubs in June 2017. Now June 2019, we are going to find out where all of our managers are and how they have been getting on. Missed our introduction? Now is probably a good time to go back! This post will be a rather in-depth look at all 24 of our managers and is likely to be one of the longest of our SurpassingPep posts. In future, the plan is to look specifically at the leagues in which our managers are in and to keep the posts shorter, but for this part it seems logical to introduce our managers and find out how they have fared in their first two seasons in football management. For the purpose of keeping these posts readable, I won’t go into copious amounts of detail per manager. For more details about the save, follow my Twitter @VivaLaVidaFM or join my Slack channel #SurpassingPep. What’s Slack? It is a platform where over 1000 members chat about FM. There are channels that you can join for specific conversations about FM, such as tactics-chat or save-ideas. For more details about the platform and how to set it up, follow this link to FMSamo‘s post. This is the manager graphic that I’ll be using every post. It’ll hopefully help us keep updated with the managers as it can become quite confusing as managers begin to move about. Let’s get started! Each manager will have a link to their Twitter as their heading. If you want to see more Football Manager content, there are so many great Twitter accounts to follow that regularly tweet about FM. Go and check them out by clicking the links! For those of you who’d rather read a brief update on the two seasons so far, rather than a review of each individual manager, skip down to ‘The Verdict’ where I’ll discuss the manager movements, league finishes and highlights. If you are interested in reading about each manager to see how they got on, read on below! 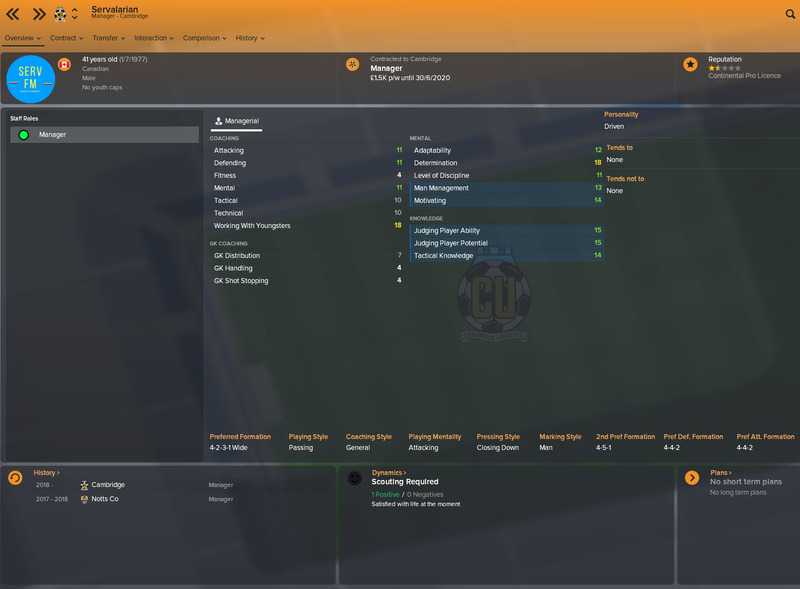 According to FM began his managerial career with Barnet who were predicted to finish 21st in League Two. 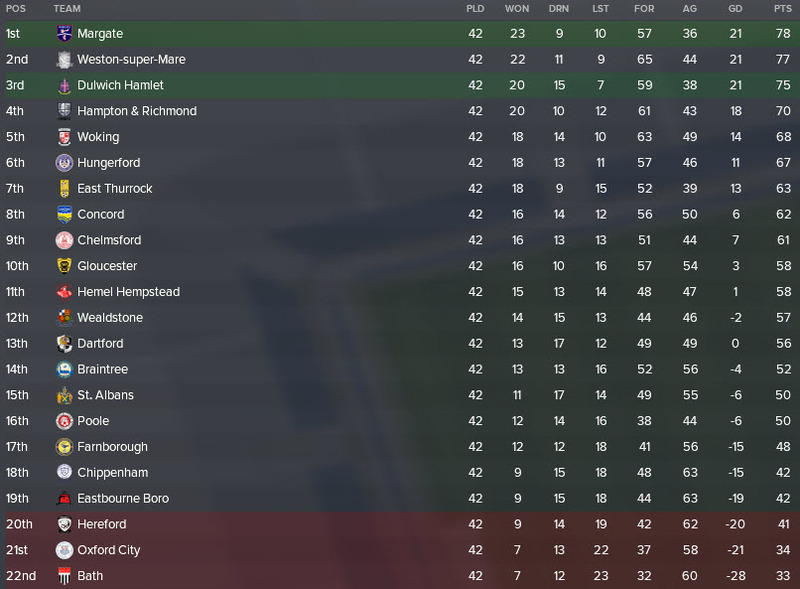 The possibility was there for our first manager to overachieve with Barnet and garner some extra reputation – anything mid-table and upwards would certainly qualify as an overachievement. Sadly this was not the case and According to FM was sacked in December. After leaving Barnet, According to FM had to wait until the end of the season before he would find work again. He joined Newport County who were relegated alongside, but a position ahead of, Barnet. 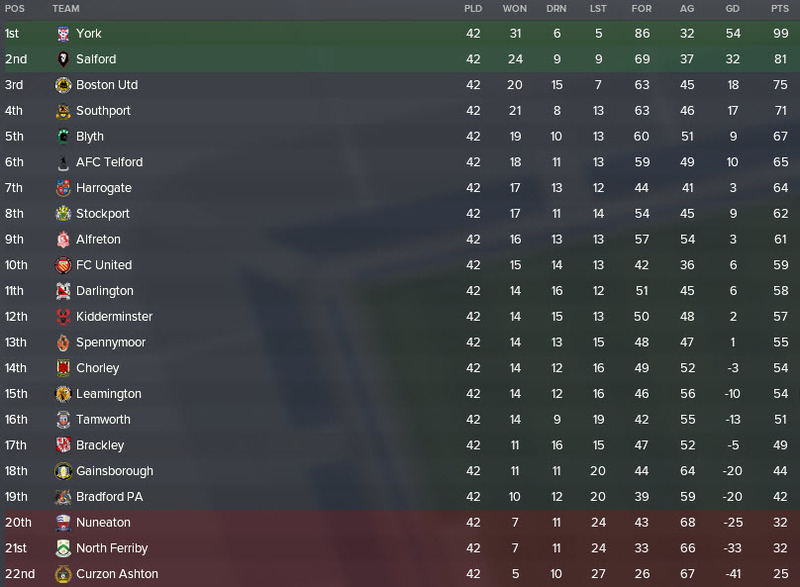 Newport were predicted to finish top of the Vanarama National, yet According to FM underperformed again and was sacked when his new club were in 10th place. He remained jobless for the rest of the 2018/19 season. Stevenage manager Youssef Amin has had an impressive first season but will end it with mixed emotions. His side were predicted to finish in 9th and eventually reached the playoff final where they lost to Lincoln. Amin will be thrilled to have seen his Stevenage side go one better in the second season by winning the playoff final! Yet it could easily have been so much smoother for Stevenage as they topped the table at the turn of the year. 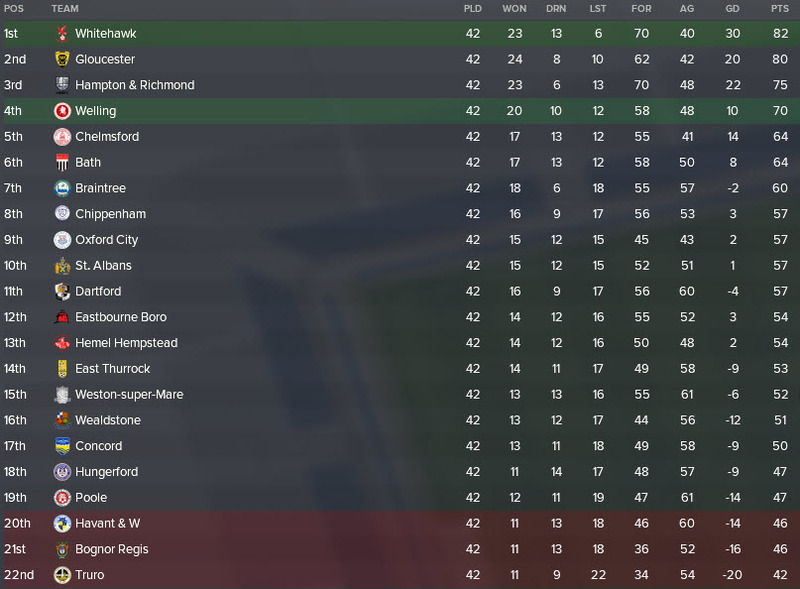 14 losses in 2019 meant that Stevenage had to battle to remain in the playoffs, but they picked up their form at the vital moment to secure promotion through the playoffs. Mikael Bergstrom took the reins of Crewe Alexandra and lead his side to a 15th place finish in the league, two places above their media prediction. Crewe managed to reach the 3rd round of the Carabao Cup where they lost to Chelsea 2-1. An impressive cup run from Bergstrom’s boys. 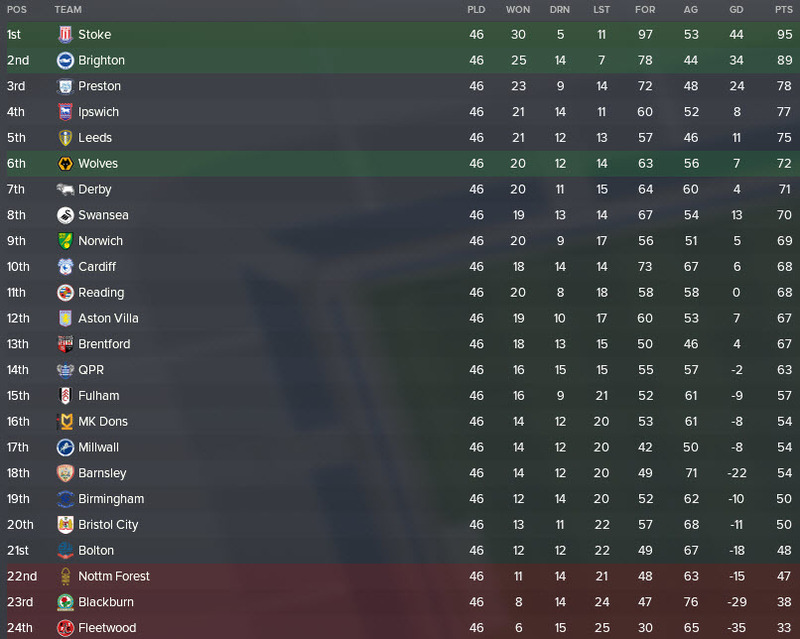 In season two Bergstrom managed to lead his side to automatic promotion as they finished 2nd in League Two – an incredible feat considering the pre-season media prediction of 15th! Bergstrom will now be hoping to consolidate his side’s position in League One and build on an impressive couple of years for Crewe. Chesterfield appointed American Ron Burgundy back in June 2017 and unfortunately this didn’t pan out as they would have liked. 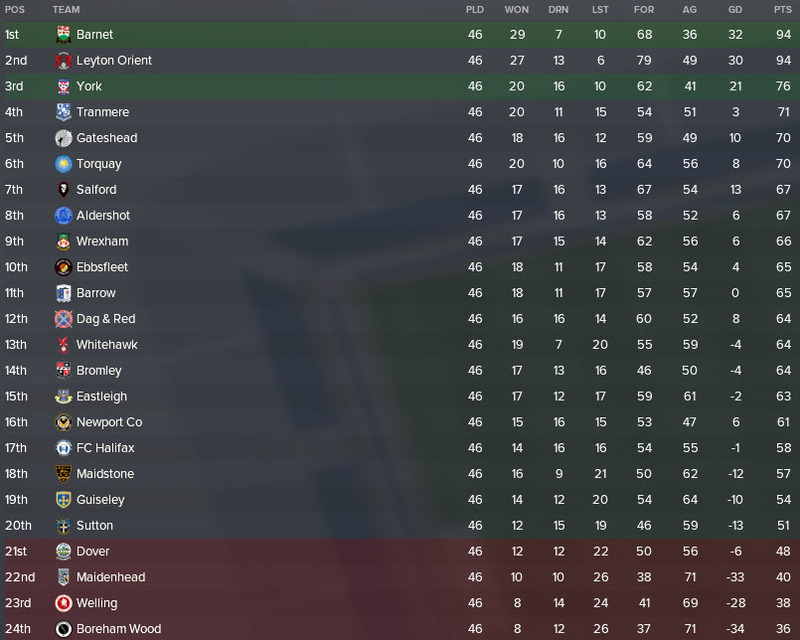 The club, predicted 11th, were 20th when they sacked Burgundy but failed to improve their standing under their new manager as they finished 19th. Burgundy found a second job with League One side Rochdale. 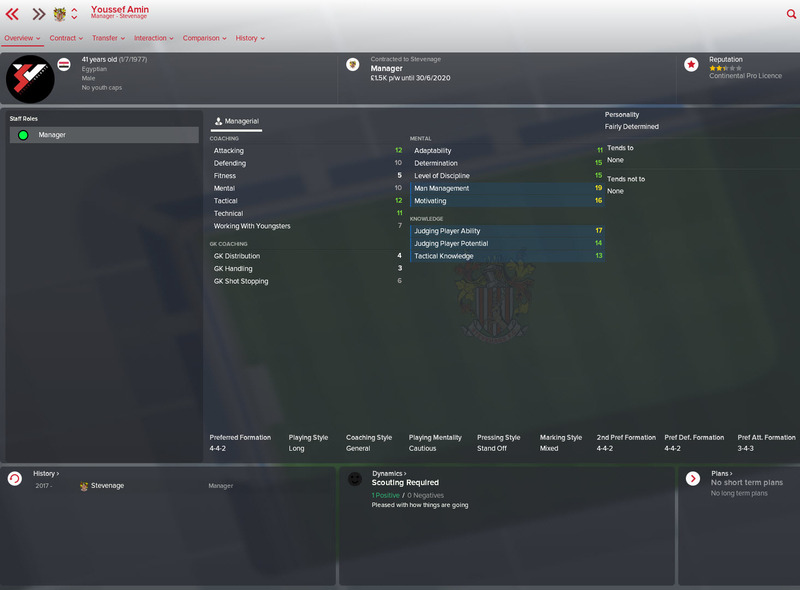 The club were battling relegation when they hired Burgundy and, although he failed to keep Rochdale up, they have decided to stick with their manager as they suffered relegation to League Two. Rochdale will be slightly disappointed with Burgundy come the end of the second season as they finished 4th. They expected automatic promotion and came so close, but sadly for Burgundy it wasn’t to be. Exeter, under new manager DeeJam, reached the playoff but fell in the semi-final of the playoff. They were predicted to finish in 8th and therefore overachieved somewhat – DeeJam would have been hoping to continue this overachievement in the following season. 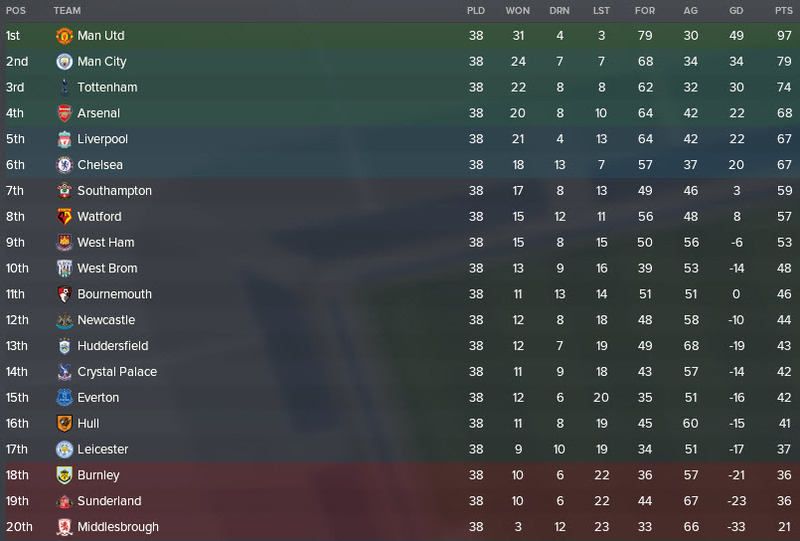 In the second season, Exeter were once again predicted to finish in 8th place. And, once again, DeeJam exceeded expectations with his club. This time, however, they finished in 1st place and secured promotion to League One as champions. A very pleasing season for DeeJam and one that must see his reputation rise significantly. Could we see DeeJam poached by a higher division side in the near future? Defence First has had an unspectacular yet solid first season as manager of Forest Green. The Rovers were expected to be involved in a relegation fight but ended the season in 16th place, never really in danger of falling into the relegation places. They improved in season two to finish in 11th place, eight places higher than predicted. Portuguese Defence First will be looking to continue the trend by going into season three with the aim of battling for the playoffs. 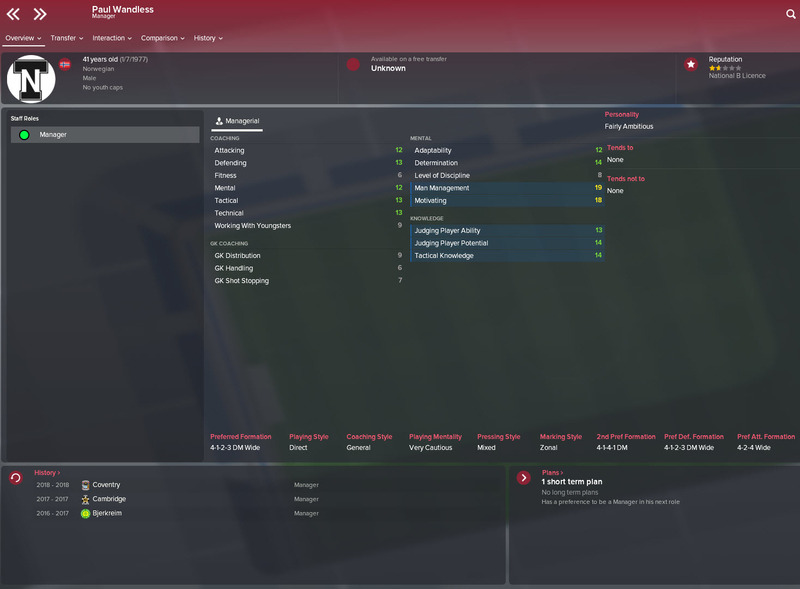 But does his side have the potential to reach League One or does he need to move to another club to rise up the leagues? Hans Down and his Lincoln side were promoted to League One the hard way – they shook of the challenge of Colchester, Stevenage and Exter to win the playoffs in season one. 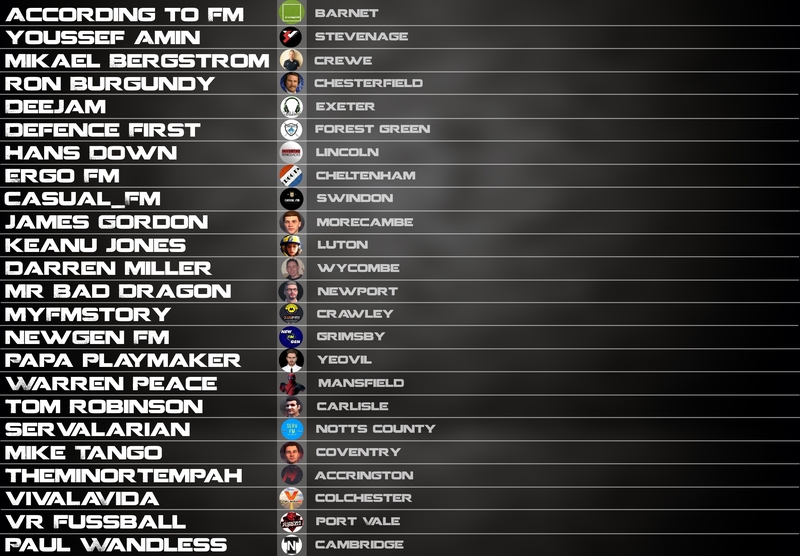 A hugely impressive season for the newcomers to League Two as they were predicted to finish in 16th. After their promotion last season, Lincoln were expected to finish dead last in League One. Yet, thanks to some rugged resistance, they somehow managed to survive in 20th place, three points clear of relegation. With survival achieved, Hans Down must look to improve his side over the summer and cannot afford another season down battling relegation. Ergo FM’s first season in charge of Cheltenham has been a promising one. The side were thought of as possible relegation candidates but have quashed critics to finish in 12th. Ergo FM will be hoping to continue this trend into his second season with the club. Our only Dutch manager became one of two managers to be ‘poached‘ by a higher division club (as opposed to being sacked and then signed) as he left Cheltenham for Doncaster in the league above. This movement, although a promising sign, didn’t work out as planned for Ergo FM as his new side were relegated from League One. Next season Doncaster will surely be one of the favourites for promotion, can Ergo FM perform under pressure? You’d think that any sort of poor run of games could signal the end for the Dutchman. Swindon Town were one of the teams expected to challenge for automatic promotion and they lived up to this tag. They spent time atop the league before late surges from Luton and Mansfield dropped them to 3rd. 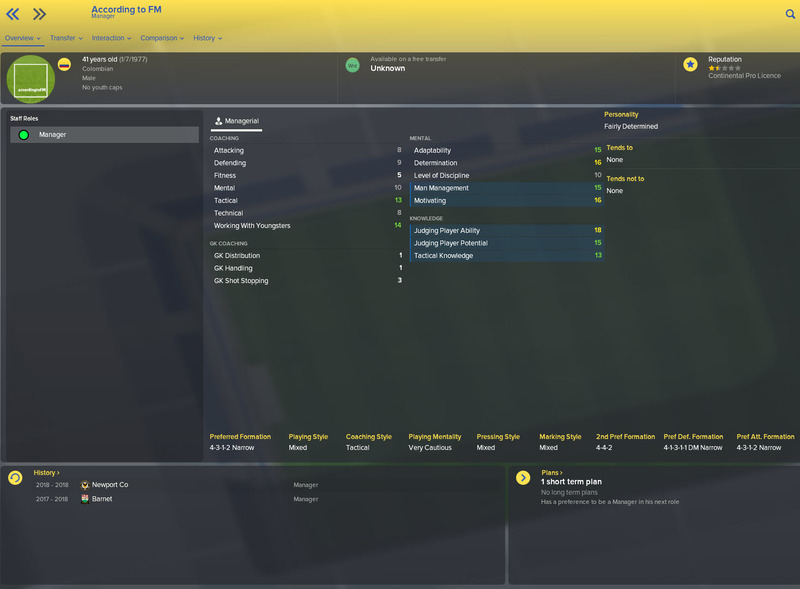 Promotion in his first season must be a delight for CasualFM. Swindon continued their excellent progress by performing to a very high standard in League One. By January 2019, Swindon were in 4th place in League One and seeking successive promotions. 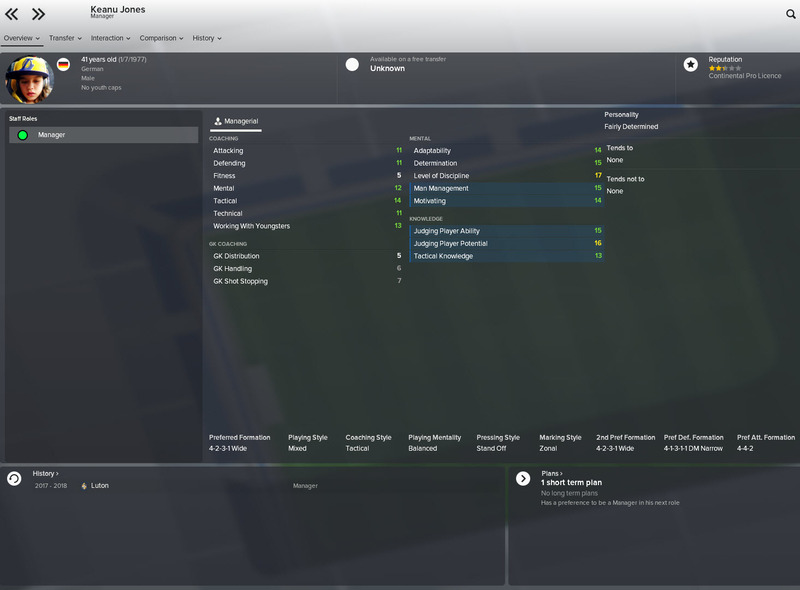 This excellent season attracted offers from the Championship and Casual_FM moved to Bolton. 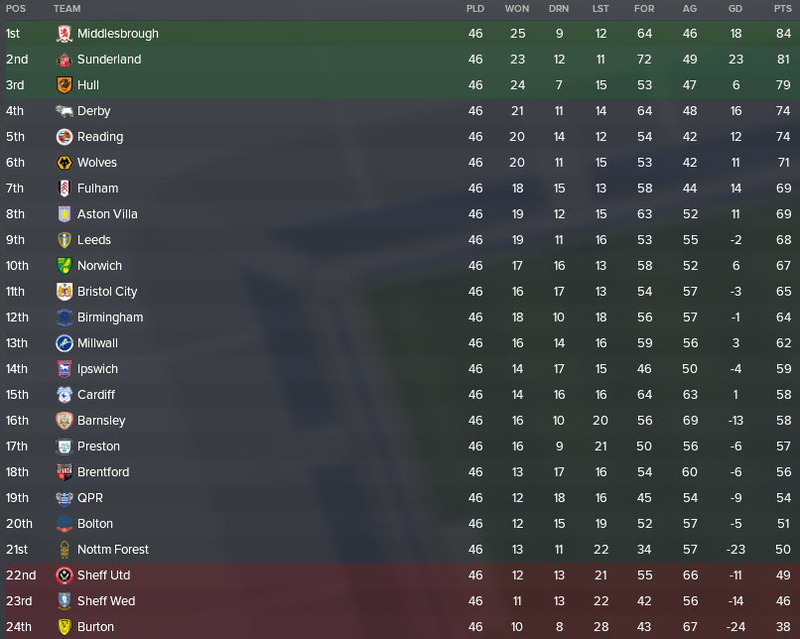 Bolton were fighting the drop and, thanks to their gamble on Casual_FM, they survived by the skin of their nose – they finished in 21st, 1 point ahead of relegated Nottingham Forest. James Gordon began his career leading Morecambe, but failed to make his mark on the side as they struggled to find any form under Gordon. Despite being predicted to finish 1 place above the relegation spots, Morecambe decided to fire Gordon in an attempt to revive their fortunes. James Gordon was approached by Carlisle in March and he accepted their offer. Carlisle were underperforming in League Two and Gordon saw them finish in 13th in his first season. He’ll certainly be hoping that in season two Carlisle can achieve what’s expected of them. In Gordon’s 2nd season he guided Carlisle to a 10th place finish, more or less what was expected of them. Moving forward the aim must be to push for the playoffs. League Two champions Luton have their manager Keanu Jones to thank. Jones helped promotion chasers Luton to a 1st place finish and they always looked certain to earn automatic promotion. Now he’ll have to turn his focus towards surviving League One. Sadly for Jones, Luton sacked their manager in November 2018 as they looked uncertain to achieve safety. This decision, although a bad one for Jones, was a good one for Luton as they did survive League One. Jones remained jobless for the rest of the second season. Mr Bad Dragon has had a challenging first job in management with Newport County. The relegation favourites (alongside Barnet) fought bravely against the drop and took the fight right up until the final day of the season. Despite their poor form in the league, Newport reached the 4th Round of the FA Cup where they lost to Premier League Leicester City. Mr Bad Dragon lost his job in May before he was offered the chance to manage Torquay in the Vanarama National. He took control of his new side in June 2018 and led them to a playoff finish in his first year. They were beaten in the 1st round of the playoff (which six teams enter) and will remain a tier 5 manager as we move onto season three. 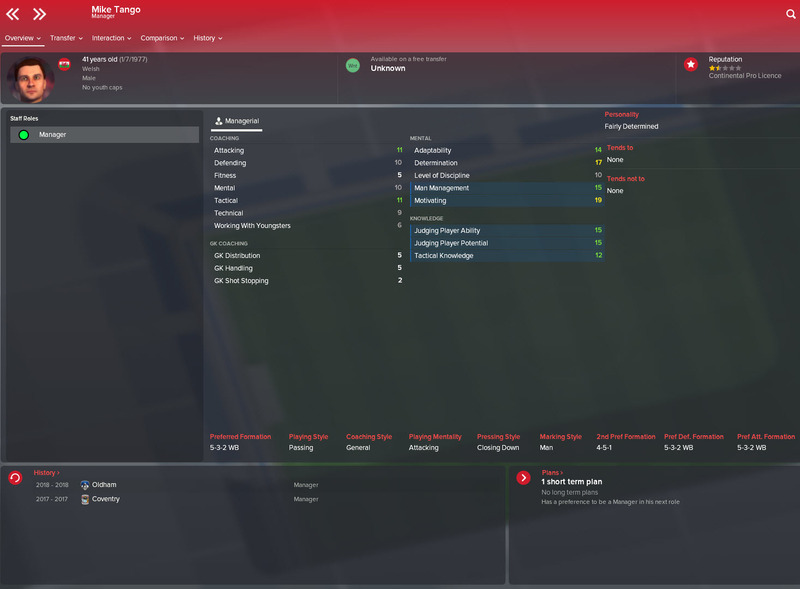 MyFMStory was chosen to lead Crawley but failed to manage the club to their desired standard. He lasted four months with Crawley before they terminated his contract in November 2017 due to their poor league position. MyFMStory went a whole year without a job, bringing about our main rule in SurpassingPep for the first time. If a manager goes 1 year without finding a job, I am allowed to move them to the next available job from the same division in which they were sacked. In MyFMStory’s case, he was moved to Plymouth. 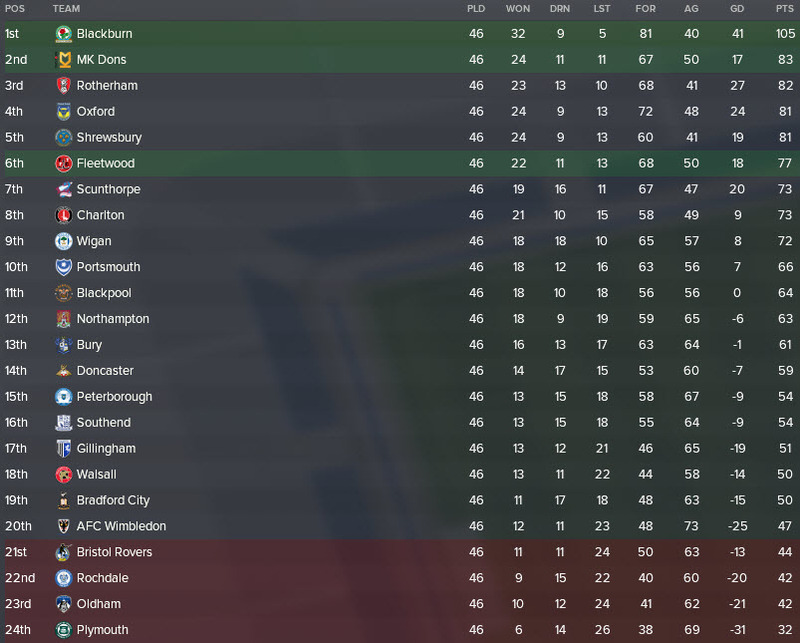 Plymouth were relegated from League One in the first season and found themselves in 24th place in MyFMStory’s first few months. But our Senegalese manager turned things around and led Plymouth to a 13th place finish. Moving into next season Plymouth could well bounce back and push for promotion back to League One if things go well for MyFMStory. 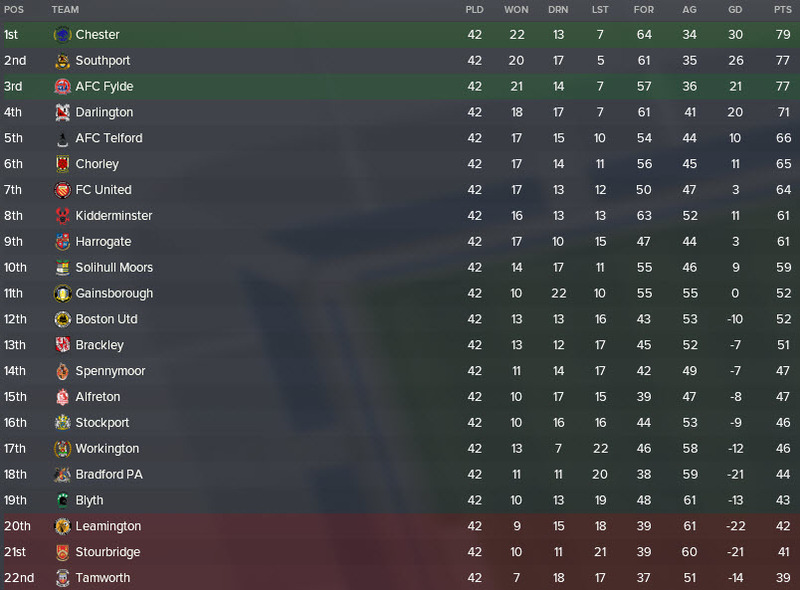 Swiss manager NewgenFM may consider himself lucky to have survived season one with Grimsby. The club were predicted to finish in 13th place but ended the season in 17th, just nine points ahead of the relegation places. Will the board allow for another underperforming season? Well, kind of. 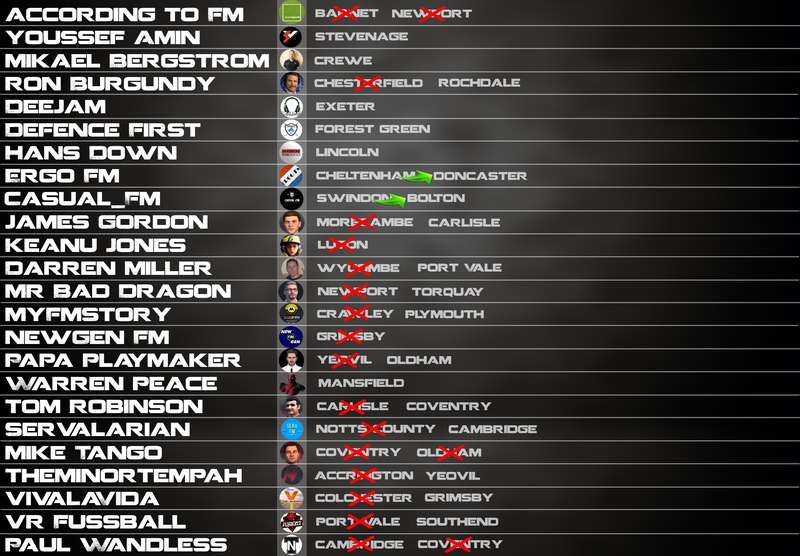 Grimsby were relegated under NewgenFM as they finished in 23rd place. 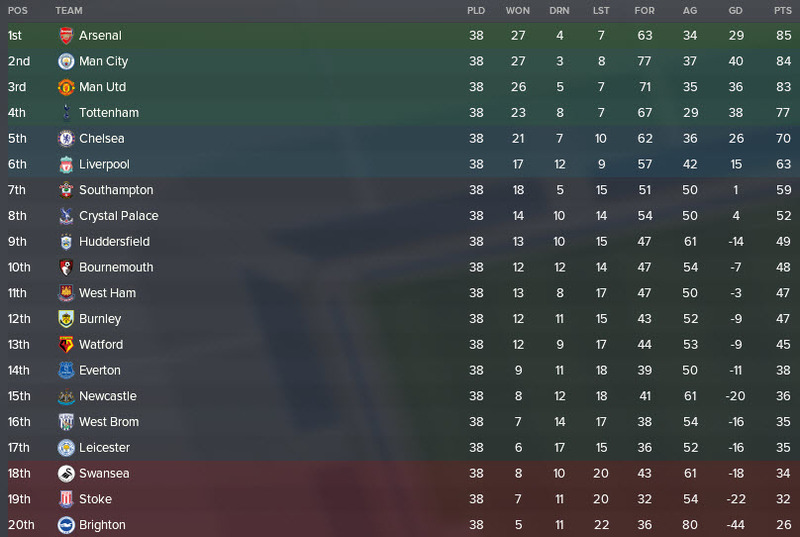 Their relegation battle went right up until the final day of the season and it was good to see the Grimsby board put faith in their Swiss manager but sadly it didn’t pay off. Once relegation was confirmed, NewgenFM was released from his role as manager. Yeovil took the decision to hire Papa Playmaker as manager and will be happy with their choice. The Italian boss led Yeovil to 14th place in his first season with the club and he’ll be looking to continue this progression in season two. Unfortunately for Papa P, Yeovil didn’t perform as well as he would have liked in season two and he ended up departing the club in early November. It was less than a month before Papa Playmaker was given his second managerial role as he was approached by Oldham. Recently relegated from League One, Oldham were predicted to finish 1st but found themselves outside of the playoff places. Papa P lifted them to 5th but was unable to win the playoffs – they lost to eventual winners Stevenage in the semi-finals. 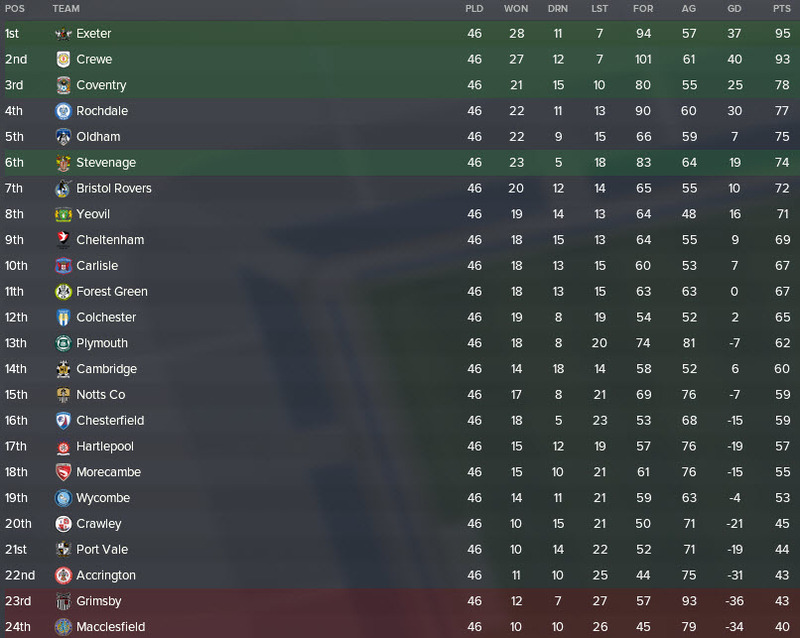 In one of the tightest seasons in recent history, Warren Peace’s Mansfield fluctuated between 1st and 5th in the final five games of the season and managed to end the season as runners-up behind Luton. A cracking season and one that was expected, the media were spot on in their pre-season prediction of 2nd. 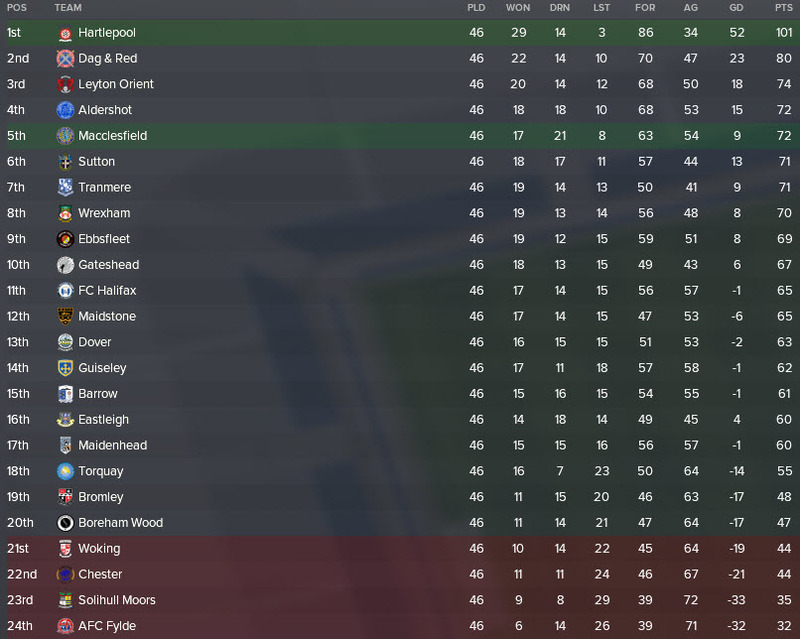 In an unremarkable but nonetheless pleasing season for Peace, Mansfield survived relegation easily as they finished in 14th place. This will give his side a decent foundation to build upon in the coming years. Could we see Mansfield make a charge for the Championship next season? Tom Robinson began his managerial career with Carlisle as they looked to be in and around the playoffs. But a run of 11 games without a win at the beginning of 2018 saw Carlisle sack their manager in March. Robinson was fortunate enough to be hired by Coventry in January 2019. 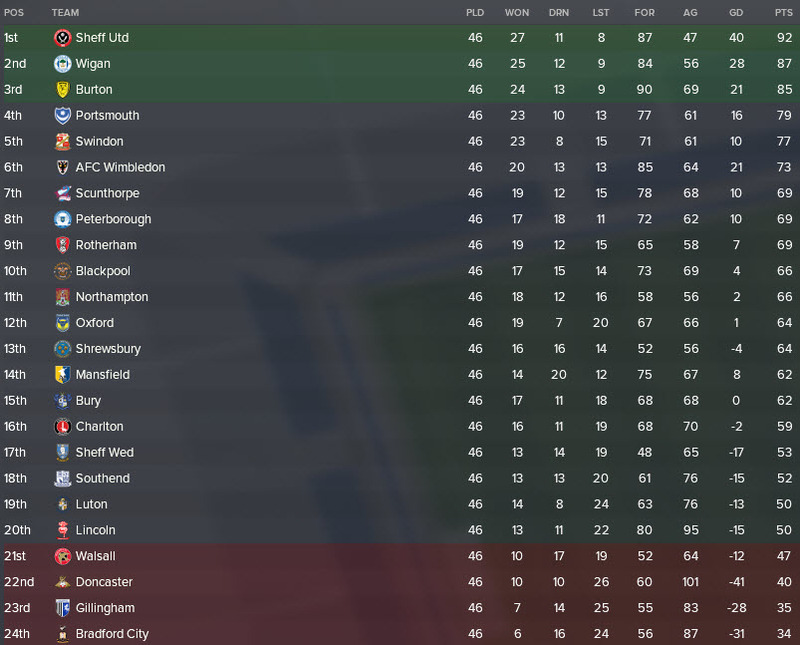 The League Two side were in 9th place despite being predicted to finish in 4th. Robinson rejuvenated the side and led them to a cracking 3rd place finish, securing their promotion back to League One. Canadian Servalarian joined Notts County and would have expected to lead the club to a safe, mid-table finish in his first season. Things were going decently until the turn of the year where, like Robinson’s Carlisle, they completely lost their form. Servalarian was sacked in February but this did little to improve Notts County’s form as they won just two league games in 2018 (and one was under outgoing Servalarian). The next destination for Servalarian was Cambridge. The club hired him in December 2018 when they were around mid-table in League Two and after a promising start, things seemed to be looking up for our Canadian. But a slump in form has led to Cambridge dropping back down to mid-table where they finished at the end of season two. Mike Tango was chosen to lead Coventry as they hoped to challenge for automatic promotion from League Two. But the pressure of spending too much time below the playoffs lead to the board’s decision to sack Tango. It wasn’t long before Mike found a second job, and indeed it was good to see the manager rise a division to join relegation-threatened Oldham. The League One side were in the relegation places when he joined and he was unable to lift them from this state. He kept his job through the relegation but didn’t last long in season two, he was sacked with Oldham lingering outside of the playoff positions. Tango is still on the lookout for his third club as manager. Accrington appointed TheMinorTempah in their bid to avoid relegation, the side were predicted to finish in 24th in season one. But their patience ran thin in December 2017, with Accrington sitting in 23rd, and they released TheMinorTempah from his role at the club. Our English manager had to wait close to one year before he found work by himself. Yeovil, down near the relegation places in December 2018, approached Tempah to become their new manager. In an incredible turnaround, Yeovil improved dramatically to rise up to 8th by the end of the second season. My manager in the game, VivaLaVida, joined Colchester and immediately set about pushing his side towards a promotion. In the first season, Colchester reached the playoffs but were ultimately beaten by eventual playoff winners Lincoln. 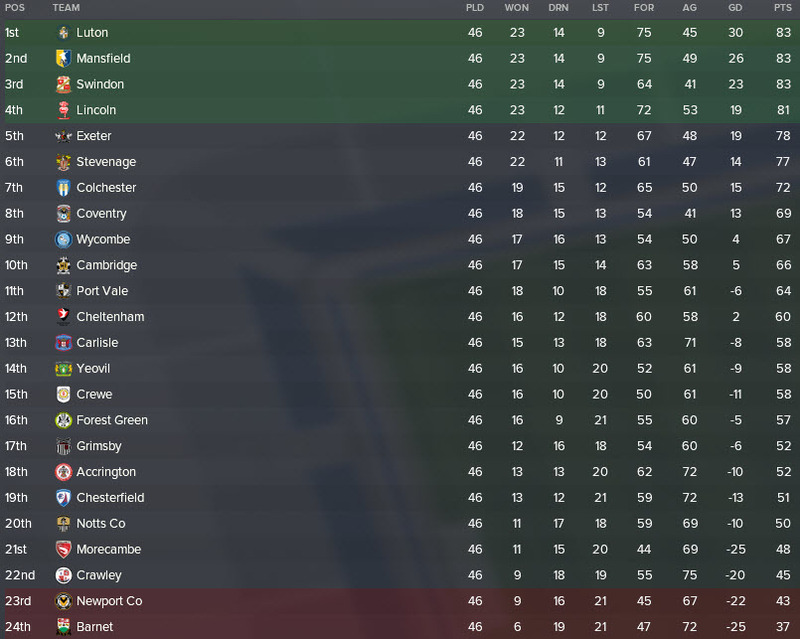 I expected my virtual manager to really start pushing his side on now, after all, Colchester are one of the ‘bigger’ League Two sides. But it was not to be, the board decided that being outside of the playoffs for too long a period should mark the end of VivaLaVida’s tenure with the club. At the end of the 2018/19 season, VivaLaVida joined his second club in management. VR Fussball achieved what was expected of him in season one, lead Port Vale to a mid- table finish. In fact, you could argue he’s overachieved slightly with an 11th place finish (predicted 14th). The aim in season two will surely be to continue the overachievement. In season two, Port Vale struggled to continue their form from the previous year and were down amongst the relegation candidates halfway through the season. VR Fussball was sacked as manager in response to this. But the Russian manager wasn’t out of work for too long and managed to rise up in the divisions, joining Southend. He survived with Southend and can now sit down to plan for season three in League One. Paul Wandless, also known as The Northman, had the ignominy of being sacked twice in the first season. He was justly sacked from his first job, Cambridge, after a poor start to the 2017/18 season before joining promotion-chasing Coventry. He joined them in …. place and ended up finishing in 8th, one place outside of the playoffs. He was, in my opinion, unfairly sacked because of this. The Northman failed to attract any offers for work in season two and will have to rely on the in-game editor. He’ll be keeping an eye on future League Two sackings as the next available job in that league will be his! Where are the managers by June 2019? The graphic above shows in detail the manager movements that have occurred so far two seasons in. 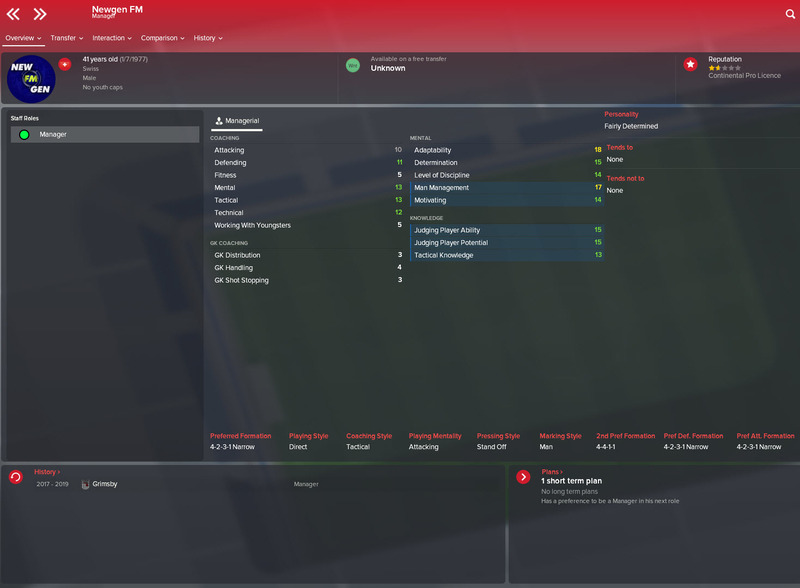 The red cross over a team indicates that the manager was sacked and the green arrow shows when a manager was signed by another club from their current club. If you’ve made it this far, well done! I don’t plan on any future posts of SurpassingPep being quite this long (except perhaps the final part) but I felt that I needed to introduce all of our managers before moving forward. If you enjoyed, please do let me know! Use the links below to stay updated with the save and feel free to ask any questions in the comments below or through social media. Thank you very much for reading the first review post in SurpassingPep, our new Football Manager 2018 series. Make sure you follow me on Twitter and perhaps more importantly join my new FM Slack group. I’ll be sharing my updates there before writing review posts here on my site. 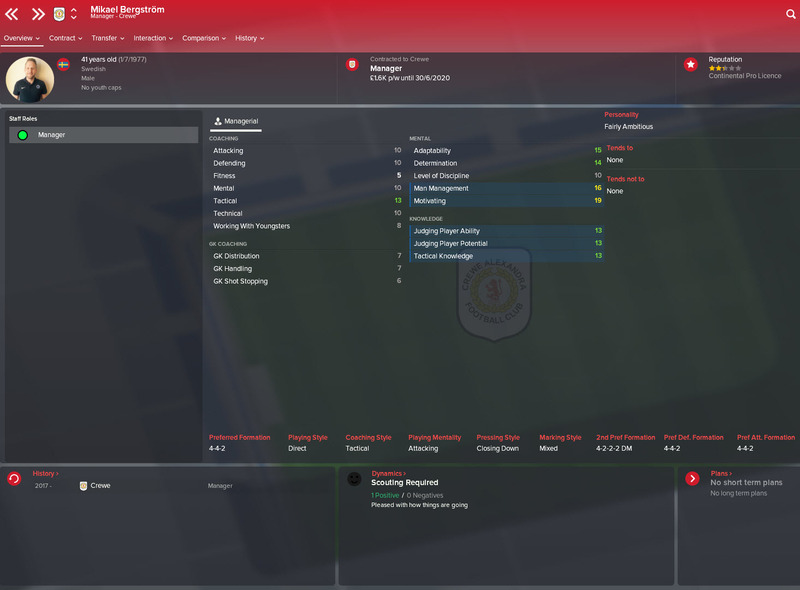 This entry was posted in FM Experiments | Surpassing Pep, FM18 Guides, Experiments & Wonderkids, Football Manager 2018 and tagged england, FM Experiments, fm18, football manager, surpassingpep. Bookmark the permalink.